What’s happening over at American Vogue HQ? After a slew of disastrous covers earlier this year, we’re suddenly getting a wave of gorgeous covers — and we’re certainly not complaining. After a sun-soaked Rihanna shoot last month, Vogue follows up with a tropical cover for July 2018 featuring modeling royalty Gisele Bündchen, after an eight-year hiatus on the cover of the American fashion bible. Photographed by Inez van Lamsweerde & Vinoodh Matadin, Gisele was captured on location in Tulum, Mexico, with stylist Tonne Goodman selecting a Ralph Lauren dress to complement the lush surroundings. Our forum members couldn’t believe their eyes. “What a surprise. She has such great energy and good body language. Well, she is a real supermodel! Still, it feels surreal to have a solo supermodel on the cover of US Vogue nowadays,” commented TaylorBinque. “I can’t believe my eyes! 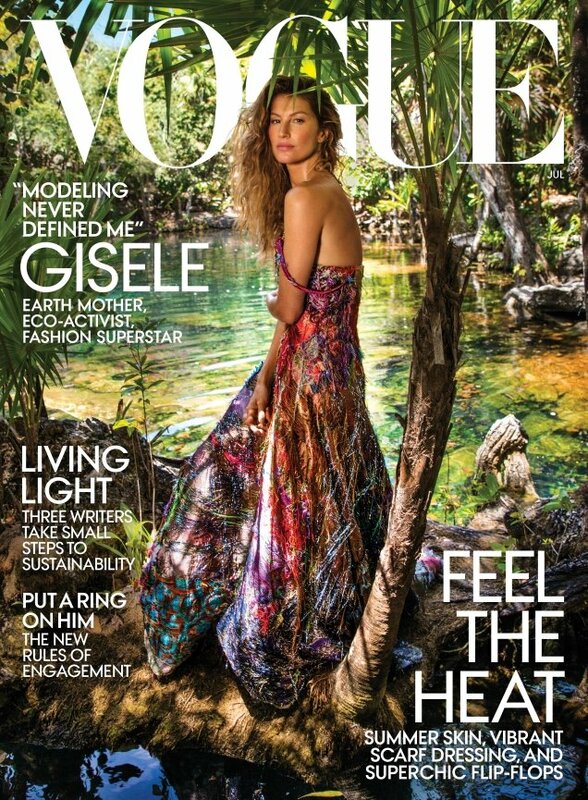 Gisele on the cover of American Vogue! A real supermodel! This is too good. Love the background. This is perfect,” apple approved. “Oh reminds me of old good days of US Vogue. Absolutely perfect!” applauded GivenchyAddict. Miss Dalloway was ecstatic. “What a perfect cover, the styling works so well with the setting and she gives perfect energy for this shot. But most of all it is glorious to see her back on the cover, her twelfth if I remember well. Finally a cover I can get excited to get, this year!” she stated. “Wow, what a wonderful cover. Amazing background, gorgeous colors and will look incredible in printed form. My favorite Vogue cover in a long long time,” bluebanter said. “Simply can’t hate on it, it’s everything which I’ve been pining for from US Vogue. A proper summer escape cover and edit. They’re really trying. Passing on the shot which everyone thinks should’ve been the cover, instead of the full length one,” Benn98 commented. See more from Gisele’s cover shoot and share your opinion with us here.